Editor's Note: This is the second of a three-part series on indie games from PAX East. Stay tuned for the third installment tomorrow, and check out Part 1 here. Whether movies, tv, or video games, I've always been a champion of the underdog. I love going to PAX and while yes, I do check out the AAA offerings, I am far more intrigued by what is being shown in and around the Indie Megabooth. Indie doesn't always automatically make something better, it's just that these days, plenty of indie games are presenting something different or putting a unique spin on a certain genre. These days, there are so many games that it's impossible to cover them all, but I wanted to bring some attention to a few that majorly piqued my interests - games that shined just a little brighter than the others and definitely need to not be overlooked. 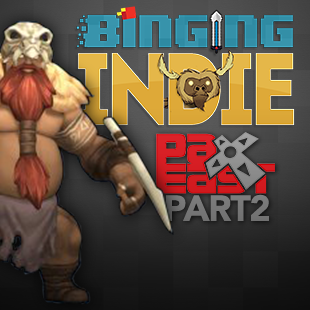 Here's part two of our PAX East Binging Indie special! Huntdown is what happens when you take Escape from New York, The Warriors, and The Terminator and blend them together into a side scrolling action shoot 'em up. In other words, awesome. You can play the game either single-player or co-op and fight against armies of 80s-inspired bad guys. You play a bounty hunter out to take out these gangs by any means necessary, which pretty much equates to blowing every one of them sky high. The environments have that grungy neon infused look of movies like Blade Runner and Robocop. The game made me think of the Contra series in terms of both gameplay and difficulty. You won't get far if you constantly run and gun; you'll have to use some strategy along with your reflexes. The game is due out later in 2017. Northgard is a real time strategy game based on Norse Mythology. You play as one of 5 different Viking clans who are fighting to take control of a new continent. Each clan has different perks and abilities, which you unlock as the game progresses. Three clans are currently available, and 1 of the mystery clans, the Raven clan, was playable at PAX. Playing Northgard for the first time brought me back to the days of playing Warcraft 2, and I mean that in the best possible way. It also reminds me of games like the Settlers series. You have to assign different characters to have different jobs in your clan, such as farmer and warrior. You send scouts to look for new lands and other clans to trade with. Conquering the lands isn't the only way to win. You can overtake a map through fame, lore, trading, and other victory conditions. Weather also plays a hand in the game's dynamic as you have to make sure your clan has enough food to last through the winter. Even in its current build, the game is impressive. It's not a 4K strategy game, which is fine by me. It keeps things faster paced without delving into micromanagement. Northgard is in early access on Steam. The original Party Hard was one of my favorite games of 2015, so I was overjoyed to see the sequel. Party Hard is a stealth action murder simulator where you play a guy who snaps and kills his neighbors because they are partying too loud at 3 a.m.
You have to be as stealthy as possible, either stabbing party goers and hiding the bodies or setting up elaborate traps for them to fall into. The game has its tongue placed firmly in cheek as people keep partying at various scenarios, despite the place being on fire surrounded by dozens of dead bodies. The sequel looks to keep the same concept, but they have made the graphics 3D this time. There also seems to be an increase in the amount of traps and other things you can use to cause as much mayhem as possible. The original had Twitch integration, which makes the game even more fun to play with an audience. The viewers can vote to have things like zombies, bears, and even Sharknados dropped into the level to make things more difficult for the killer. The team has even more Twitch events planned for part 2. The synth pop soundtrack is also set to return with a new score by Felipe Adorno Vassao, the composer of the original. The game is set to release on Steam sometime over the summer. Only Tiny Build could make a game like a graveyard simulator and make it hilarious. You play a guy who inherits a graveyard and is aided by a talking floating skull who may or may not be a figment of your imagination. You have to do what you can to keep your business profitable, which comes down to just how awful you want to be. One such awful thing is you can open a hot dog cart near the church to sell hot dogs to the villagers. The meat is, well, you can guess where the meat is coming from. I have a soft spot for some grand gallows humor, and this looks like it will definitely hit that spot. I don't know much beyond those basics, but personally, I'm already on board. It's expected to release on Steam around October. The game is sold as "Stick figure Skyrim," and that suits it quite well. You create your character out of a few different templates and head across the wild west of the Kingdom of Loathing universe. I played as a "Beanslinger," which is their version of a magic user. You use beans to cast spells, and I can only surmise there will be the occasional fart joke to go with them. The gameplay is incredibly silly with intentionally "bad" graphics that are completely charming. However after playing for a few minutes, I was surprised by how much depth was in the game. It's obvious this was aimed to be a mobile game, but it looks like one of the few that will play just as well on a desktop PC. It's due out later this year on PC/Mac/Linux and iOS.